The dash lights are what you might call 'subtle'. Whilst by no means dangerous they could do with brightening up a touch. The usual suspect is the rheostat which is operated via a small dial on the dashboard. This allows the lights to be dimmed if too bright; needless to say mine has always been cranked up to max. One option is to just by-pass the 'stat by joining the two wires, the equivalent of setting the 'stat to max. 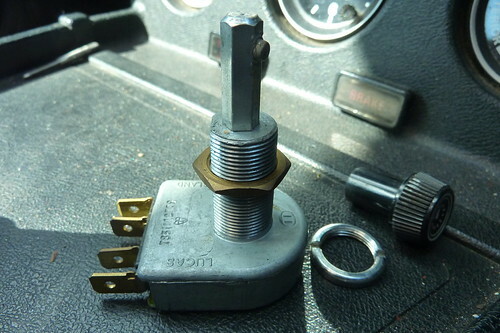 Additionally this avoids a defective 'stat from sucking all the current and making the lights even dimmer. In hindsight I wish I'd done this first. However I didn't. I decided my 'stat must be defective, but wanted the operable dimming option to be retained, so I went down the route of a new one. Taking the old one out is not difficult if you have a contortionist's hands. The knob is removed from the front by locating the sprung catch in the stem (you can see this in the top photo, the small protrusion towards the top f the metal stem) and pulling off the plastic cover. You can then unscrew the metal collar which holds the 'stat against the dash. Behind the dash you can then pull the 'stat out, you'll find it easier to remove by unclipping the wires before you do, but this isn't easy either. Anyway, turned out the replacement didn't make any difference - duff one? No, as I then tried just connecting the two wires together to by-pass it and the lights remained stubbornly dim. I'm leaving it there for now, but there are options if I wanted brighter lights such as swapping the old bulbs out for brighter or just newer ones, or even painting the inside of the dials white to better reflect the light.